Between Jan. 29 and Feb. 7, the Minnesota DNR will conduct five public hearings – in Rochester, New Ulm, Bemidji, Duluth and Plymouth – on a proposed revision of the state’s list of endangered and threatened species.Learn more. The Twin Cities need about 200 new monitoring wells, at a cost of nearly $9 million over four years, for state agencies to keep track of how much water we have, how fast we are using it and how good or bad is its quality. That’s the recommendation of a new report to the Minnesota Legislature prepared by the Department of Natural Resources. Last spring, the Legislature directed the DNR to “develop a plan for the development of an adequate groundwater monitoring network of wells in the 11-county metropolitan area.” And lawmakers told the DNR to submit its plan by Oct. 1. The 11 counties covered by the law are: Anoka, Carver, Chisago, Dakota, Hennepin, Isanti, Ramsey Scott, Sherburne, Washington and Wright. At present, the DNR has 177 observation wells in those counties, and water levels in the wells are monitored about 10 times a year. The new plan – prepared by the DNR in consultation with the U.S. Geological Survey and a number of state agencies – recommends installing about 60 “nests” of wells drilled into the overlapping aquifers that lie under the Twin Cities. For example, a nest of wells in Minneapolis probably would include four closely spaced wells, ranging in depth from about 60 feet to 900 feet. And each well would be monitored electronically monitored in real time, yielding measurements of water levels on a daily or hourly basis. The new wells would not supplant separate wells used, or planned, by the Pollution Control Agency, the Minnesota Department of Health or the Department of Agriculture to monitor water quality. But the DNR plan calls for gathering substantially more water quality information from the new wells than currently is collected from DNR observation wells. 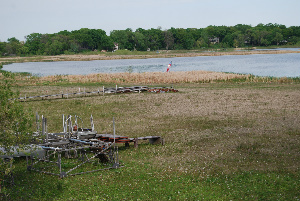 The $8.9 million four-year cost the DNR estimated for the new monitoring wells includes $5.5 million for drilling the wells and installing monitoring instrumentation; $1.4 million for technical support, including computer modeling of groundwater supplies; and $2 million for developing a web-based means to store and disseminate data on water quality and quantity. Part of the law asked the DNR to estimate the cost of building and operating the proposed 11-county monitoring system on a “cents per gallon” basis. The estimated four-year cost of drilling and operating the wells, spread over the approximately 140 billion gallons of ground water pumped each year in the 11 counties, comes to .0000001589 cents per gallon per year, or $15.89 per million gallons.